Many top Stamford domestic violence defense attorneys will get a lot of inquiries about “civil orders of protection” a/k/a restraining orders which are not really criminal domestic violence matters but are closely associated with domestic violence to the degree that any discussion of domestic violence law would not be complete without an analysis of civil restraining orders. Victims of crimes and victims who are in need of protection from abuse and harassment often seek assistance from experienced Stamford restraining order lawyers to make sure that the process goes smoothly and the relief requested is granted by the Court. On the other hand individuals who have been served with restraining orders, sometimes based on false or misleading allegations, frequently will seek the services of an experienced attorney to advise them on how to contest the restraining order which has significant consequences which we will discuss at greater length below. In many situations these civil orders of protection form a vital function in placing a barrier between parties who are in a relationship that is dangerous or traumatic. However, all too frequently these orders of protection which were meant to provide protection for victims of domestic violence are used by unscrupulous and aggressive divorce attorneys as a method to get the upper hand when commencing a high stakes contested divorce. By using the civil restraining order as a tactical weapon these divorce lawyers can bend the facts and file twisted affidavits in an attempt to gain “exclusive possession of the marital home” in one day by getting a Judge to grant an “ex parte” civil order of protection. The good news is that if you have been served with an “ex parte” civil order of protection under these circumstances is that you are entitled to a full evidentiary hearing before a Judge where you can retain an experienced Stamford restraining order attorney to cross examine your accuser and defend your rights. If you have been served with an “ex parte” civil order of protection and have a pending Court date it is important that you seek legal counsel from an experienced Stamford restraining order lawyer who can advise you concerning your rights and be available to represent you during the hearing which will determine if the temporary order will become a permanent order which will last for an entire year. If you are a victim of domestic violence and wish to file for a restraining order and would like sound legal guidance on how to proceed and have an experienced advocate to represent you during the hearing on your application we can assist you also. Regardless of where you live in Fairfield County, whether it is Greenwich, Darien, Stamford, Norwalk, New Canaan, Westport, Fairfield or any other Town there are only three Courts that handle these types of matters in Fairfield County the Stamford J.D. at 123 Hoyt Street in Stamford; the Fairfield J.D. at 1061 Main Street in Bridgeport and the Danbury J.D. at 146 White Street, Danbury, CT. At the Law Offices of Allan F. Friedman we understand the frustration and confusion that goes along with navigating the rough waters of a rocky relationship and facing court proceedings and allegations at the same time. These situations can cause a lot of stress and uncertainly. You can call us 24/7 for a free consultation and we will be happy to explain the entire process to you and provide you a fee quotation for our services. Why Would a Victim of Abuse Need a Restraining Order? Why Not Just Go to the Police and Get the Abuser Arrested? The legal standard to obtain a civil restraining order of relief from abuse order is that the applicant must have been subjected to a “continuous threat of physical pain or physical injury, stalking or a pattern of threatening.” This begs the question, why wouldn’t an applicant seeking such an order just go to the Police and ask the Police to arrest the person who is abusing them? Ask any top Stamford restraining order attorney and they will explain that there are several reasons and the answer varies from case to case. In some situations the Police are in the process of making an application for an arrest warrant which can take up to several weeks to process. In these situations the Police will advise victims of domestic abuse to file for an immediate civil order of protection which can take effect as early as the same business day to provide immediate protection against the abuser until the arrest warrant is completed and the abuser can be arrested and brought before the Court. (As a side note in many instances I have obtained ex-parte civil restraining orders for crime victims under these circumstances and the subject of the restraining order has frequently violated the order within a few hours of being served and winded up being arrested for criminal violation of a civil restraining order). In other situations which can be more border line the Police may lack the probable cause or evidence needed to make a criminal arrest but nevertheless the situation between the victim and the abuser may be quite volatile and dangerous. In these situations often the Police will advise victims to go to civil Court and file for an order of protection because the Police just do not have enough evidence yet to make a criminal arrest which requires a higher standard of proof than a civil order of protection which only requires a civil standard of proof which is proof beyond by the preponderance of the evidence. Sadly, in some situations applicants go to Court to seek orders of protection in very weak cases as a precursor to a high conflict divorce case filing. Anytime someone makes an application for a civil order of protection at the same time they are commencing a divorce case it should be looked at with a bit of suspicion. In many situations unscrupulous aggressive divorce lawyers advise their clients to file these civil orders of protection in an attempt to quickly and effortlessly gain exclusive possession of the marital home and gain and upper hand on the opposing party in the divorce process. In these situations red flags are often that the applicant will raise incidents that have occurred often years before the date of filing. If the abuse was so bad why did the applicant wait so many years to being this to anyone’s attention and just by coincidence right before the filing of a divorce? Frankly, there is no other way to put this, anyone can file for a civil order of protection and they can fill out what ever nonsense they want in the affidavit which supports the application. The Judge who is reviewing the paperwork has no way of knowing when some allegations are simply totally false, inaccurate and without merit. Over the years I have defended many civil restraining order applications that were denied after they were heard at the hearing phase before a judge who reviewed all the evidence. If you have been wrongly accused of being an abuser and are facing a restraining order hearing contact a Stamford restraining order lawyer today to discuss your defense options. The consequences of having a civil restraining order issued against you are too serious to handle it in a casual manner without effective and competent legal representation. If your relationship with the abuser does not fall within one of these narrowly defined categories which are generally the same categories as the ones used to define the scope of victims of domestic violence crimes then you can’t apply for a civil restraining order. There are no fees required by the Court to apply for a civil restraining order and the State will also pay for the fee for the State Marshall to serve the papers upon your abuser. While you do not need to have a lawyer to apply for a civil restraining order it may be helpful to have an experienced Stamford restraining order lawyer who has worked in this area of the law assist you in the drafting of your affidavit and in representing you at the hearing of the application. This is especially the case where the respondent (alleged abuser) is going to retain their own counsel and contest the restraining order. If you are going up against an experienced attorney as a pro se litigant you may be operating at a disadvantage. The main thrust of the process of civil orders of protection of restraining orders is that they are processed and acted upon extremely quickly given that fact that many victims are involved in situations involving a present and credible risk of imminent physical danger or harm. A victim of domestic violence who wishes to seek an order of protection has to appear at the Clerk’s office of one of the J.D. Courts I have listed above during normal Court hours and fill out a form JD-FM-137 application for relief from abuse and a JD-FM-138 affidavit. Although the Clerk’s office can answer your procedural questions about how to file the documents and when the Court will rule on the completed application the Clerk is unable to provide legal advice or instruct you how to draft your affidavit which supports the application for relief from abuse. In the application process choosing the correct language for your affidavit is the most important factor in getting your request for “ex-parte” relief granted. If your words are not chosen properly regardless of the danger or harm you face the Court is not going to provide you the relief which you are seeking. When reviewing these affidavits the Court is looking to see if the applicant’s allegations are sufficient to meet the statutory criteria. Often people who are not trained in the law will include a lot of irrelevant facts and being so emotionally involved in the subject matter at hand often lack the perspective needed to examine the totality of the circumstances from a disinterested perspective and isolate the key buzz words and facts that will trigger a Judge to enter an “ex-parte” or immediate order. For this reason it is always a good idea with so much at state to consult with an experienced Stamford restraining order lawyer to get some assistance in drafting the all- important affidavit which supports your application for an “ex-parte” restraining order. “Ex-parte” relief means that the Court will immediately enter a civil restraining order, on a temporary basis, without hearing any input from the opposing party. The Court has State Marshalls on assignment to immediately serve the civil restraining orders and the court will register them with the local Police Department. If you are the victim of domestic violence or under the threat of a dangerous stalker this is obviously the kind of protection that you are seeking. However, this drastic level of action is reserved for those situations in which the Court feels that there is an immediate and urgent risk or danger of imminent physical harm. In these extreme cases where physical safety is an urgent consideration the Court will enter the other of protection immediately and then schedule a hearing within 14 days at which the respondent can contest the allegations of the affidavit and put on evidence which refutes the allegations of the applicant. Obviously these type of immediate and drastic orders can have very disruptive consequences especially when you are residing with the applicant or when children are involved and you suddenly have to vacate the family home on a moment’s notice and find a new place to live until the hearing in 14 days. In cases where the Court does not feel that there is an immediate crisis or present danger of physical harm often the Court may deny “ex-parte” relief but set the matter down for a hearing in 14 days to ascertain whether or not a civil restraining order of some sort should issue. Obviously, this is less than an ideal result for a victim who is seeking protection. The alleged abuser who is the respondent is now going to receive a copy of the application and the affidavit along with notice of the Court date and there is no Court order in effect at this time offering you any protection what so ever. Especially in situations where the parties are co-habiting this can result in a very unpleasant 14 days of waiting until the Court hearing date. 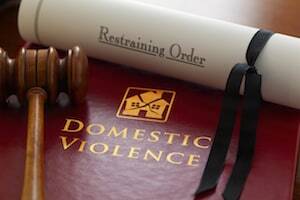 If you have been served with a “ex-parte” civil restraining order or order of protection contact a Stamford restraining order attorney today to review your legal options and rights. The weakest or entry level order is known as the “partial order” and requires that the subject of the order to not harass, assault or annoy the victim. While this order basically enforces the protections which any persona enjoys under the criminal law against these kinds of behaviors by elevating the penalties to a class C felony it still allows so called “normal” contact between the parties. This often leads to grey areas and disputes over what constitutes normal communication and what constitutes a “threat” for example. Anyone who is subject to a “partial” civil restraining order should tread very carefully in any interaction with the protected party as any dispute over a disagreement between the parties leading to a so called “he said / she said” disagreement may lead to an arrest warrant for violation of a civil restraining order which is a serious felony. The mid-level civil order of protection is the so called full order also known as a residential “stay away” order requires that the subject of the order stay away from the home of the victim. However, as with the “partial” order this order does permit normal communication between the parties as long as the subject of the order does not enter the home of the victim. Simply due to the nature of civil restraining orders and the high levels of risk and danger which bona fide cases of domestic abuse present the most commonly imposed type of order in the context of civil restraining orders is the full no contact order. This is the most restrictive civil order of protection. This order simply restricts any contact what so ever between the parties of any kind. The burden is on the subject of the order to avoid contacting the victim. If the victim initiates contact with the subject it is not an excuse for violating the terms of the order and would result in a criminal charge against the subject of the order. No contact means just that no contact. In some situations the Court will extend the zone of protection to an area within 100 yards of the victim and the subject is precluded from coming anywhere within 100 yards of the victim. Finally, this kind of order can be extended to the workplace of the victim, it can be expanded to limit any contact with the minor children of the victim and also the Court has the power to protect the pets and animals owned by the victim. By statute the Court must assign a hearing date within 14 days of the initial application. These hearings are like mini trials in which testimony and evidence is presented and the Court will determine based upon the preponderance of the evidence if the applicant has proven the allegations contained in the affidavit. Generally, the applicant has the burden of proof and will present their side of the case first, subject to cross examination by the respondent. This is not a jury trial and the trier of fact is a Superior Court Judge who generally has a lot of experience in handling these applications as they generally handle several of them each and every day. While the pace of the proceedings if very fast paced in some cases if you have multiple witnesses to call the hearing can in fact wind up taking several days to complete as the Court generally tries to squeeze these civil restraining order matters in between other ongoing trials and cases. The first step when you arrive will be a mandatory meeting with the Office of Family Relations who’s job is to try and convince the parties to agree to the entry of a civil restraining order without going before the Judge for a contested hearing. Obviously if you are the applicant, this is a great way to resolve the case as you get the relief you are seeking by agreement without having to risk an evidentiary hearing which you may lose. However, if you are the respondent, it would seem foolish to voluntarily agree to the entry of a civil restraining order which has significant negative consequences and implications without at least taking a crack at it and putting on your case before the Judge. You basically have nothing to lose in fighting the case. The Family Relations Officers are tasked with the job of trying to get the parties on a path towards more harmonious and peaceful interaction and also saving valuable Court time and they will generally exploit the party’s lack of experience with the Court system and anxiety to get them to often make agreements which may not be in their personal best interests. For these reasons, if you are an applicant for a civil restraining order or a respondent defending against one facing a hearing at Court you should seek the services of an experienced Stamford civil order of protection attorney to guide you through the process and be there to provide you a proper legal defense and put on an effective legal presentation on your behalf. While these cases may move very quickly and seem somewhat informal the consequences are very serious and all of the typical Court rules of evidence and procedure apply. Having a skilled legal advocate with experience in litigating civil restraining order matters can make the difference in the outcome of your case. Depending on the nature of the allegations and the budget that you have to invest in a defense strategy in some situations we can use the two week period while we are waiting on the hearing on the civil restraining order to take depositions and subpoena documentary evidence such as telephone records and social media accounts to aide in the defense or prosecution of the application. The first step in any civil restraining order case is to come in for a detailed free initial case consultation during which we can discuss all of the facts of your case and develop and defense strategy that suits your situation. The best part about these type of proceedings is that because they are generally very fast moving and over with very quickly our fees for legal representation are flat fees and very reasonable. Call today for a fee quotation. It is important to understand that once a civil restraining order is in effect it has the full force and effect of law and is registered with Police. If the terms of the order are violated in any manner no matter how slight the violation it can result in the filing of an arrest warrant for a felony charge of criminal violation of a civil restraining order. This is a very serious criminal allegation and it is a class C felony punishable by up to 5 years in prison. More serious violations which involve violence or entry upon the home of the protected party are more serious felonies punishable by up to 10 years in jail. Very often in situations where emotions are running high and these events are unfolding in a rapid manner it is not uncommon for the subject of the order to be known to respond to texts from the victim or try to initiate some contact with the victim in violation of the terms of the other. Despite the facts that there was no violence or injury or any kind the Police take these violations of orders of protection very seriously and will in every case make an arrest. If they can’t immediately locate the subject of the order and effectuate a custodial arrest then they will apply for an arrest warrant. While it may not seem like that serious a matter since no injury or danger has occurred the reality is that the local Police, State’s Attorneys and Courts all take these so called minor or “technical” violations of restraining orders very seriously. No matter how minor or slight the violation of the terms of a restraining order is alleged to be the Police will still seek an arrest. The theory is that unless the terms of the restraining orders are zealously and consistently enforced they will not be respected and the power of such orders will have less effect at deterring domestic violence abusers from breaking them. Having a criminal arrest for a felony charge can have a lasting and serious effect on your future employment prospects and is a serious matter. If you have been arrested for a violation of a civil restraining order you need to contact an experienced Stamford criminal defense attorney to review your options. If you are arrested for the violation of a civil restraining order as a consequence you will now be also a domestic violence crime offender. You will be required to attend a next day arraignment at which the Court will enter criminal orders of protection which are very similar to the civil retraining orders. The major distinction being that they are issued by the Court automatically as a condition of your release from jail and no one has to prove the allegations against you in order to get the order granted (unlike the civil variety). However, if you are represented by a competent lawyer they may request a Fernando A. hearing at your arraignment in which you can have a review of the entry of the criminal protective order and an evidentiary hearing to review whether or not the order is the correct type for your situation and if it should continue. As a consequence of your violation of the civil restraining order now you will have two orders of protection issued against you one in the civil Court and one in the criminal Court. As a result if you were to engage in further violations of the order of protections each violation would involve the commission of two separate felonies as you would be simultaneously violating a civil restraining order and a criminal order of protection. Of course if you find yourself in this situation you should seek the counsel of an experienced Stamford domestic violence defense attorney in order to receive advice on how to proceed. Must surrender all firearms and long arms and ammunition; unable to possess, purchase or own any weapons. Will be detained when entering the United States for enhanced screening and interrogation. When stopped by law enforcement for routine traffic stops will be subject to heightened levels of scrutiny and inquiry about the restraining order. The continual possibility that the victim is going to accuse you of breaking the terms of the civil restraining order in some manner which would result in your arrest on a felony charge of violation of the order. Having a pending civil restraining order can come up on criminal background checks and have adverse effects on your ability to secure employment. For these reasons before you have a hearing on a civil restraining order you should speak with a Stamford restraining order attorney at the Law Offices of Allan F. Friedman to plan the best defense and contest the allegations against you. Contact a Restraining Order Attorney Today! We provide free initial consultations. We have 25 years of experience dealing with the filing of and defense of civil restraining orders throughout the State of Connecticut. Working with an experienced Stamford civil restraining order lawyer with experience in the area of domestic violence defense can make the difference in the result of your case. If are seeking to file a civil restraining order of defend against one which has been served upon you in Norwalk, New Canaan , Fairfield, Greenwich, Stamford, , Darien, Cos Cob, Westport, Wilton, Weston, Bridgeport and throughout the County of Fairfield do not hesitate to contact the Law Offices of Allan F. Friedman. Our rates are reasonable and we offer payments plans as needed. Call Attorney Friedman at 203.515.4110 to schedule your free initial consultation we are available 24/7. Or you can contact us online for a prompt response.